According to the government of India, the payment for each employee is now done as per the new pay matrix which is done by multiplying the employee’s basic pay with 2.72 to be exact. This new multiplication system is done so as to keep the employees well on their feet in today’s date and time. The Government employees’ wage increases and rarely decreases but always fluctuates as per the ups and downs of the economy in the country. So how did we arrive at the figure? The figure has been deduced by checking the new pay matrix that has been released by the government. The commission has released a new payment scheme in the 7th CPC. Those changes have been made on the existing grade pay. Hence they will affect all the posts of all the government employees who are within the pay band of 67000 and 79000. Step 1: By identifying the basic pay (which is a summation of the pay band and the grade pay. This will correspond to the employee as and from the date of implementation. Step 2: Now the figure that we have obtained from step 1 will be taken and multiplied with 2.72. Whatever we obtain will be rounded off to the next whole figure. Step 3: now we take the figure that we arrived to from the second step or we take the next higher figure which is suited for his or her pay band in that grade. If this figure obtained is less than the person’s starting pay then the pay will by default be equal to the starting pay amount. 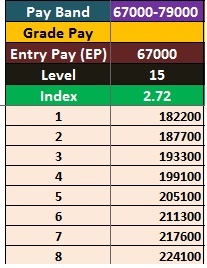 If one gets promoted to the HAG pay scale of 67000-79000 after getting only one increment, then the payment from the pay band will be added to the existing grade pay. Also, to the sum of those two Rs. 2000 more will be added. This will be done until the pay is a minimum Rs. 67000 (highest Rs. 79000). There will also be another exception if the person is promoted from the post of Deputy Secretary, under secretary or its equivalent. The pay will then be calculated by granting a sum that is 6% of the Basic pay. With this, a sum of Rs. 1000 will be added (because the difference between the grade pay of the deputy secretary and the under secretary is Rs. 1000 as per pay band 7600 and 6600).